The most expensive G-Shock in the line-up, the MR-G 20th Anniversary "Hammer Tone" also relies on traditional Japanese metalworking for its case decoration, blending old and new. The G-Shock is one of the best selling watches in history. Invented in 1983, the G-Shock sold 50 million units by 2009. And of all the G-Shocks ever made – that’s over 2000 different models to date – the G-Shock MR-G 20th Anniversary Hammer Tone is arguably the peak. 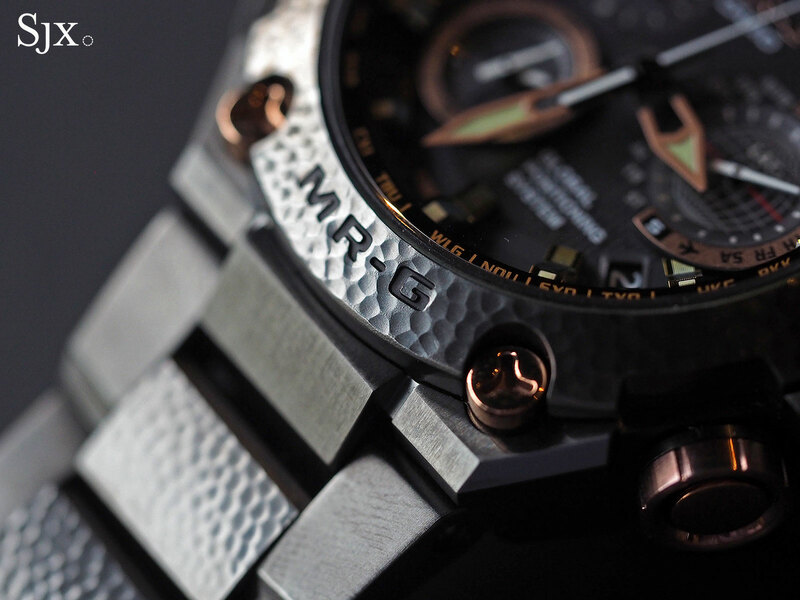 Made to mark 20 years of MR-G – the top of the line G-Shock range distinguished by titanium cases and bracelets – the Hammer Tone gets its name from the hammered finish on the bezel and bracelet. While the movement and functions are identical to the MRG-G1000 models, the case finishing is what sets the Hammer Tone apart. 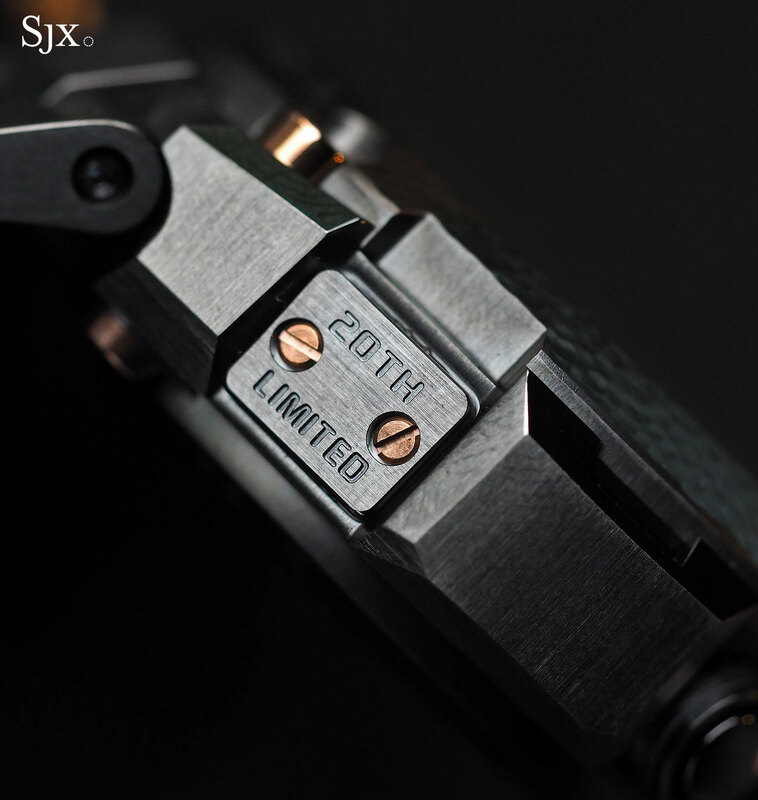 The construction and finish of the case are remarkably fine and precise, good enough, in fact, to impress someone familiar with high-end mechanical watches. 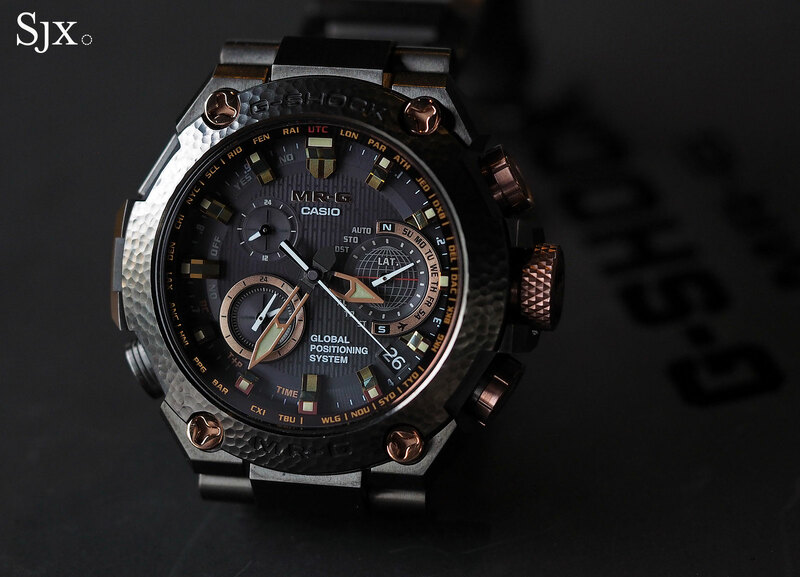 As a watch, or more accurately, a high-end gadget, the Hammer Tone is typical of the G-Shock genre, being very big and complicated looking. Very large but relatively light, the Hammer Tone is 49.8mm in diameter and 16.9mm thick, but it feels smaller and is notably light for its size, at just past 150 grammes including the bracelet. The movement does everything, and then some. It’ll sync with GPS satellites, and failing that, will set itself according to radio time signals that are broadcast in Germany, China, Japan the United Kingdom, and United States, ensuring the Hammer Tone keeps time to the fraction of a second all the time. And it boasts a long lists of functions: world time function, chronograph, countdown timer, alarm, perpetual calendar, battery indicator and backlight. Running for 18 months on a full charge, the Hammer Tone is solar-powered; the dial is actually a solar panel. Like many other Japanese electronics that tend to be over-designed – the opposite of Apple’s minimalist interface – the Hammer Tone is daunting to operate. That kind of complexity is expected. A G-Shock with a single button would be like an iPhone with a keypad – abnormal. The dial is busy, really busy. The main hands indicate local time, with the 10 o’clock sub-dial showing 24-hour time for local time. Home time is shown on a 24-hour sub-dial at eight o’clock. The sub-dial at three o’clock is a time display Swiss army knife, able to to show several things depending on the setting of the watch: day of the week, latitude, daylight savings or standard time, amongst others. 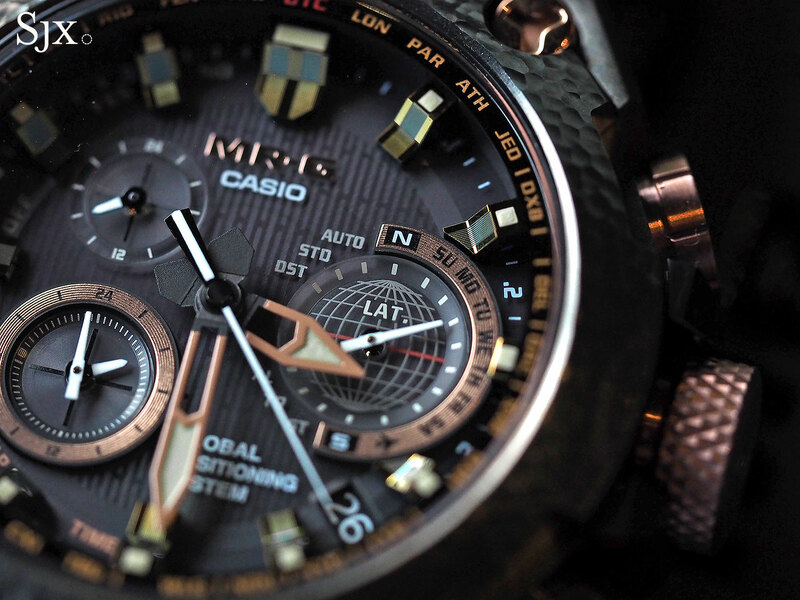 The functional complexity of the dial is equalled by its construction. Multi-layer with applied rings for the sub-dials, the dial also features three-dimensional, step-shaped hour markers that are precisely machined. The only aspect of the dial that is lacking is the lettering on the solar panel, which shows bleeding around the edges when examined up close. As an object, however, the MR-G 20th Anniversary is finely made. 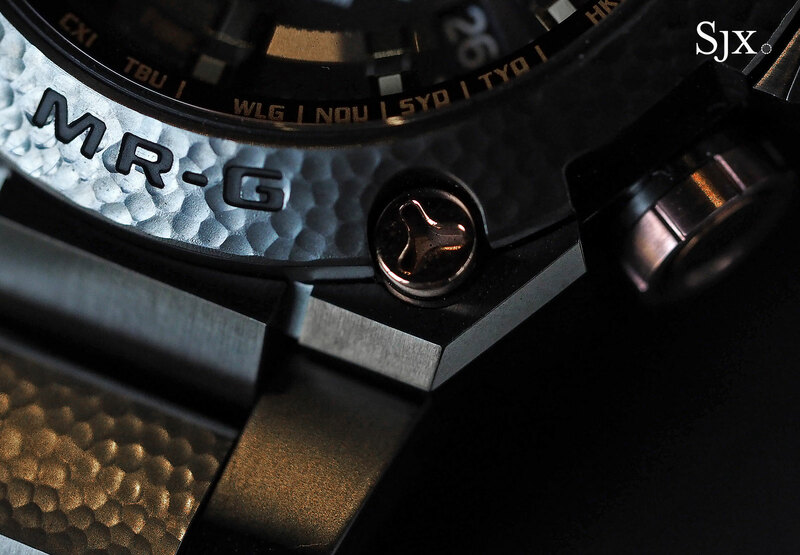 The basics of the case making are identical to that of the ordinary MR-G watches: the raw case is first stamped out of a titanium bar and then cold forged – pressed into shape by tremendous pressure that also increases the density of the titanium. 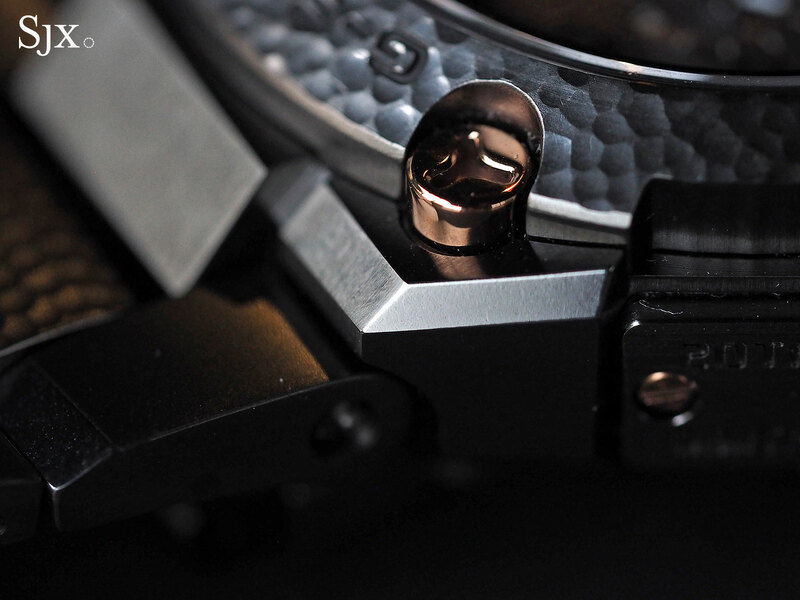 The forged case is then polished, first by machine and then by hand, giving the surface exemplary neatness and consistency of the sort typically found on pricey mechanical watches. All the edges of the case are remarkably sharp, while the flat surfaces are exceptionally flat, without any distortion. 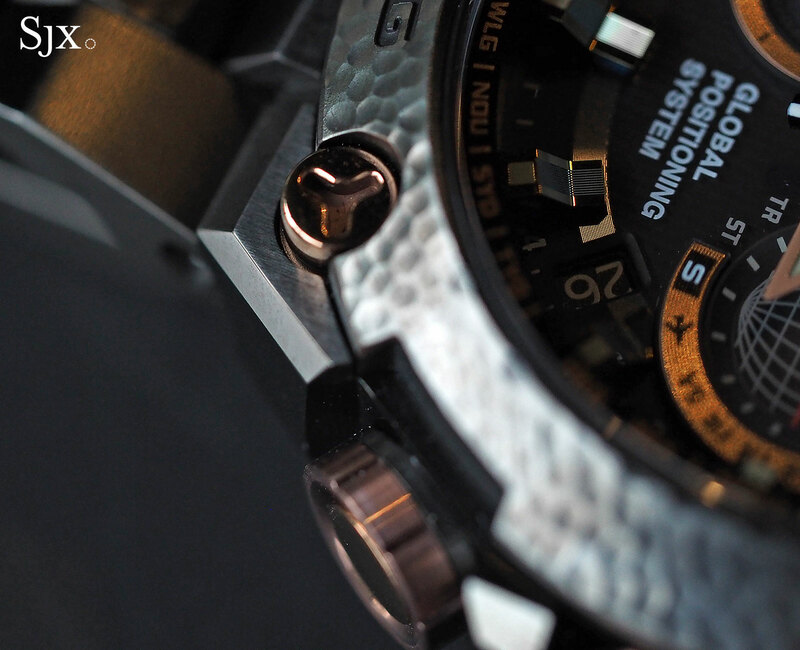 And then the alloy is hardened and coated with diamond-like carbon (DLC), making it scratch-resistant. In fact, the surface is more scratch-resistant than conventional DLC-coated cases, because the hardening of the titanium raises its surface hardness to bring it closer to that of DLC. That prevents delamination, which is the coating peeling off when the metal surface below is deformed (suffering a dent for instance), because the hard coating cannot conform to the deformation below. But that is just the finishing process for the ordinary MR-G. 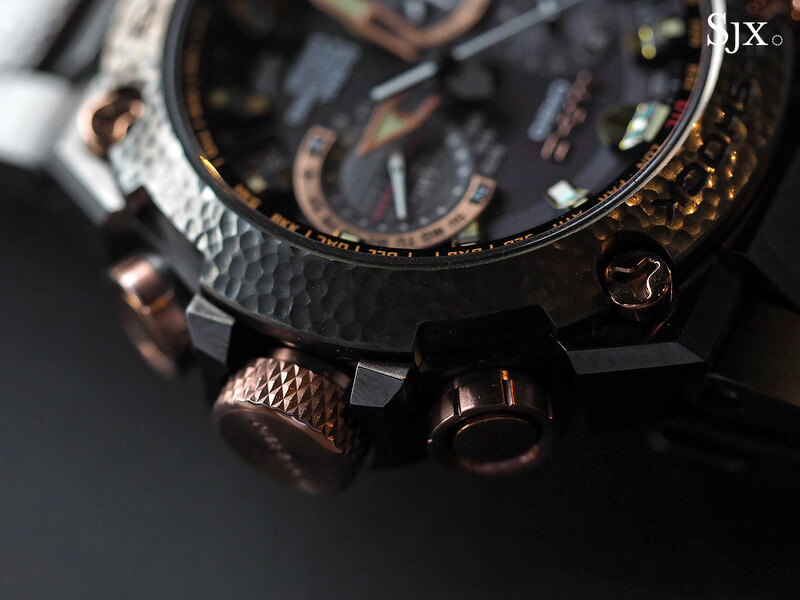 The Hammer Tone then undergoes additional hand-finishing, drawing on centuries-old metalworking that contrasts with the cutting edge technology inside the case. A method traditionally used on copper ware in Japan (but also found in other cultures; high-end cymbals are often hammered), tsuiki is a hammering technique that hardens the metal surface by compressing it, as well as creating a decorative texture. 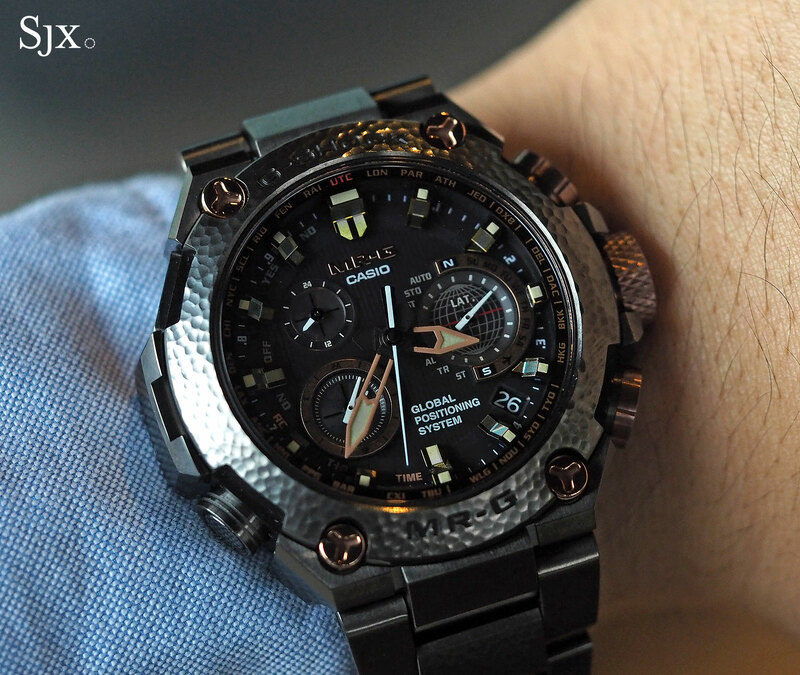 Casio recruited Bihou Asano, the third generation in a family of tsuiki craftsmen, for the Hammer Tone. Based in the ancient capital of Kyoto, Asano has created copper ware objects for the Kyoto State Guest House and Osaka City Central Public Hall, as well as performed restoration of artefacts deemed to be Important Cultural Property by the Japanese government. Tsuiki is used to decorate the bezel and bracelet links, which being titanium, are significantly harder to finish than the soft metals traditionally used, typically copper. Consequently Asano had to develop new techniques and tools for the task. He finishes every Hammer Tone component by hand, leaving each watch slightly different from the next. Only three watches can be made per day, limited by the number of components Asano can hammer. 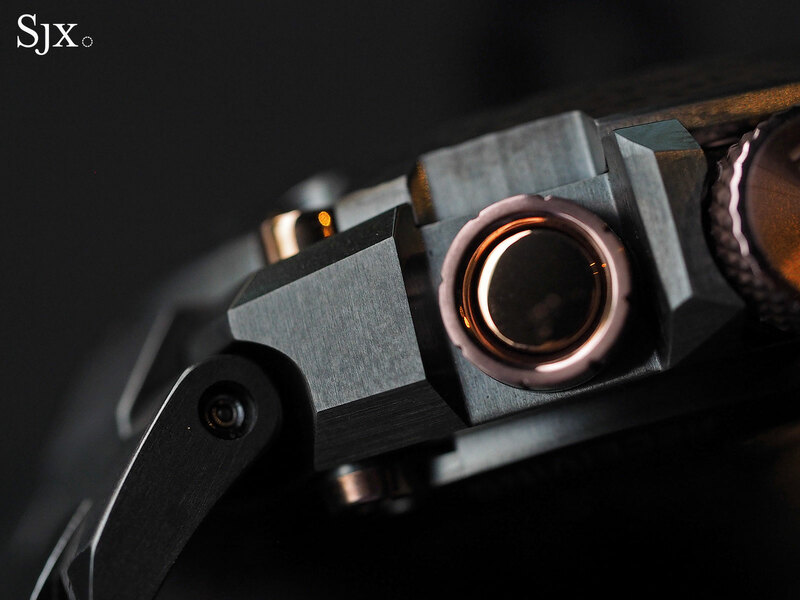 Traditional metalworking extends to the colour of the bezel and bracelet, with the hammered components being a tone lighter than the rest of the case. They are plated with oboro-gin, which translates as “vague silver”, an alloy of mostly of copper mixed with silver that’s often used for parts of a Japanese sword, for instance the tsuba, or sword guard. Also derived from traditional Japanese metalworking is the akagane plating on the pushers, crown and bezel screws. Translating as “red metal”, akagane is an alloy that mixes copper with a tiny amount of gold, 3 to 5 per cent in the Hammer Tone, and traditionally used for samurai armour. And then there’s the inescapable question of the cost. 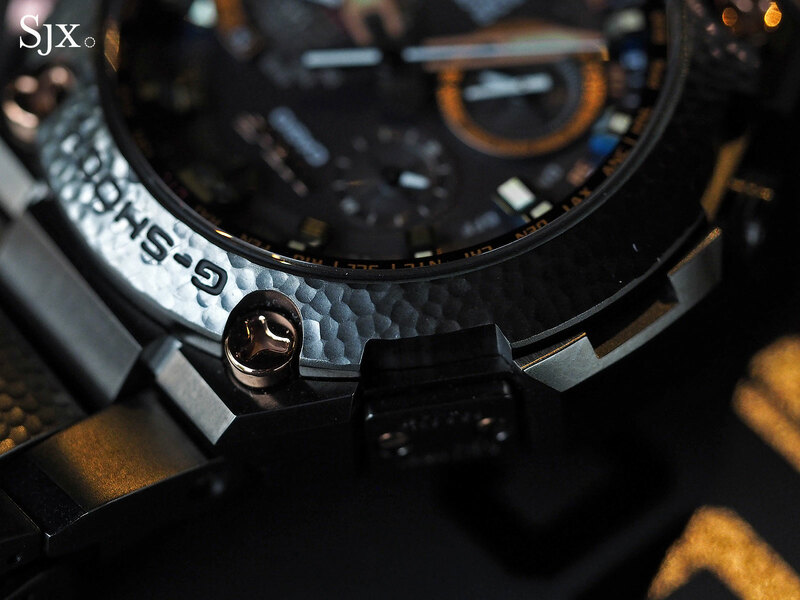 As a G-Shock, or more generally, an electronic watch, the Hammer Tone is stupendously expensive. But the quality of the case and bracelet is lofty enough that the Hammer tone compares well with luxury watches that cost more. 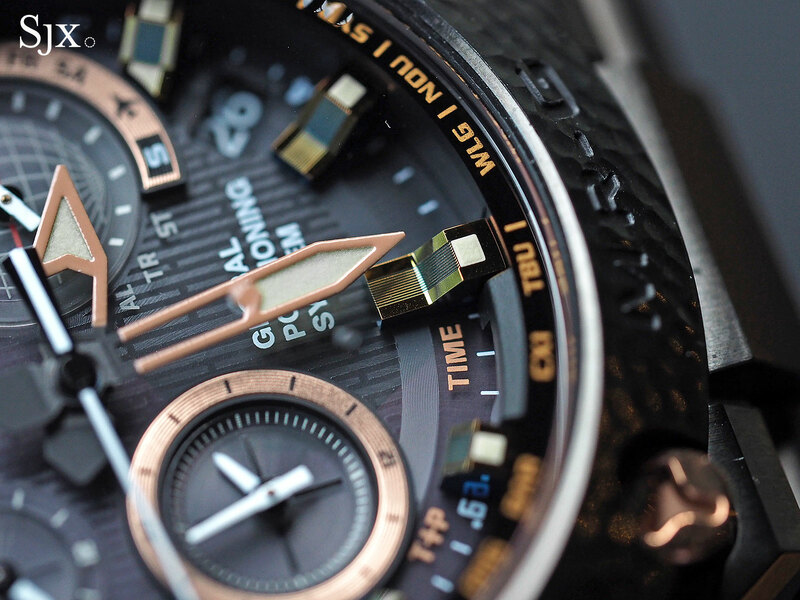 Seen as a luxury watch with electronic insides, the Hammer Tone is more easily digestible. The value proposition of the watch a peculiar equation but will only appeal to a narrow audience. But with only 300 made that’s an easily solved equation. The G-Shock MR-G 20th anniversary (ref. 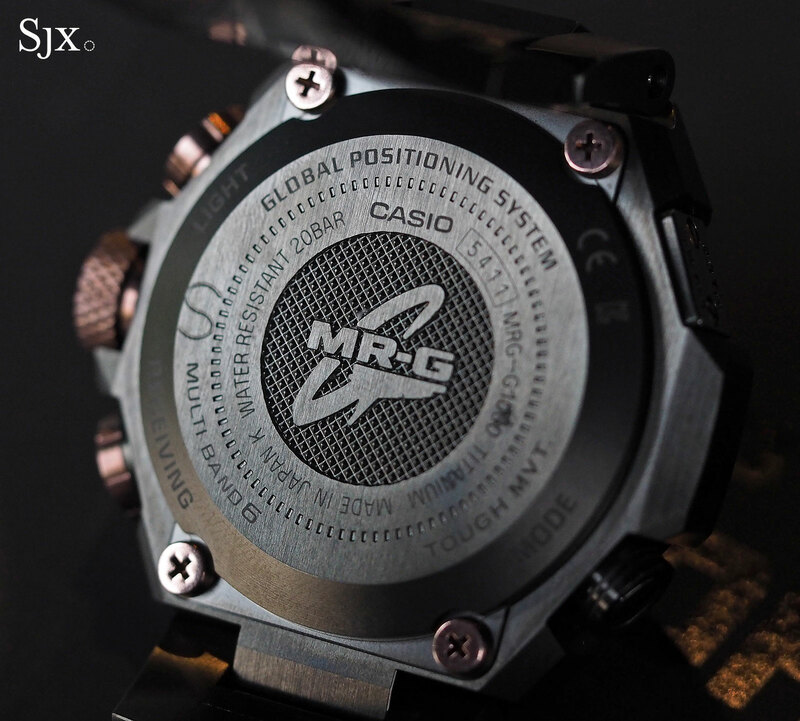 MRG-G1000HT) is limited to 300 pieces, priced at US$6200 or S$8888. Update July 27, 2016: Production number per day added.